Will keep the splendid golden appearance without having to wash teak every day with fresh water. Applying the product seals the pores of the wood thus preventing the penetration of the dust and dirt that darken it, and also protests the natural teak oils against the ultraviolet rays that oxidise and discolour them. The dressing also prevents liquids such as diesel oil, fish blood, and paints from penetrating the wood, making subsequent cleaning easier. 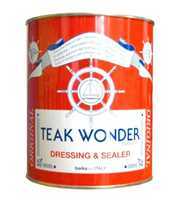 Teak Wonder Dressing and Sealer does not smell once fully applied, does not become shiny or slippery, does not stick, dries rapidly and does not make or build up the surface. It is the clearest of treatments during application and becomes practically invisible once it has dried.